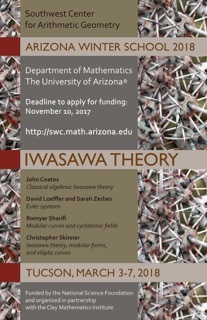 The Arizona Winter School is an intensive five-day-long school in which advanced graduate students work closely with senior faculty and postdoctoral fellows. In contrast to a typical conference at which individual researchers present their work in relative isolation, the AWS features a small number of extended courses on a set of closely related topics. The organizers work hard to ensure significant interaction among all participants. For instance, each speaker is assigned a group of students who work with him or her and a postdoctoral assistant on a research project during the Winter School. These students present the results of their research in a lecture at the end of the meeting. Other students work with a postdoctoral assistant in a problem session related to one or more of the lecture series. Still other students work in study groups, carefully learning the material from one the lecture series together. To facilitate work on the projects, problems, and study groups, speakers, assistants, and students meet in evening working sessions. Participants frequently describe the AWS as a highly intense, but particularly productive, experience.